Click Here to Download the Aegis Oil Distributor Pack in .pdf format. Aegis Oil is a privately and wholly New Zealand-owned company, established over 25 years ago. Aegis Oil combines a tradition of reliable customer service, with an extensive range of premium quality virgin automotive and industrial lubricants. Because we at Aegis Oil blend and distribute our own range of premium lubricants, we offer our customers peace of mind of knowing you are dealing with a New Zealand company, with its focus on New Zealand businesses. 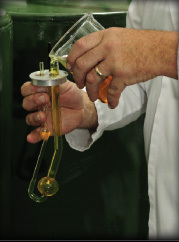 Our ﬁrst class blending process uses high quality additives to international speciﬁ cations in line with SAE (Society of Automotive Engineers) and API (American Petroleum Institute) industry compliance. With well-known New Zealand identity, Paul Radisich, at the helm Aegis Oil is a progressive company, researching and developing lubricant solutions for tomorrow. Aegis Oil’s distributors enjoy the beneﬁt of a personal service based on traditional values. We know how important it is to you that you can get an answer to a technical query immediately and that our personnel are available to help you maximise your sales. Our structure offers ﬂexibility, ensuring we can respond to your requirements with ease and speed. Our 30 years of experience means we have a solution for any challenge. The plant, a 1400 sqm former Caltex manufacturing base is a fully functioning oil blending facility with an air-operated mixing system having a capability of blending all speciﬁcations from mineral through fully synthetic. Our plant comprises the blending lab, a packaging and labelling department and the technical and administration ofﬁce. We package all size and quantities from 600ml to bulk orders of 1000L and because we undertake the complete process we can custom package and label under any branding for the retail market. We employ 10 manufacturing personnel at the plant, supported by an ofﬁce staff of four, who are responsible for technical support, administration, sales and marketing. We are very proud to be a New Zealand company employing New Zealand staff. We believe it is hugely important to support our own local economy. We have created a range of products for this marketplace and we are working hard to put something back with a better product for our customers and all the beneﬁts of being a home grown Kiwi company.